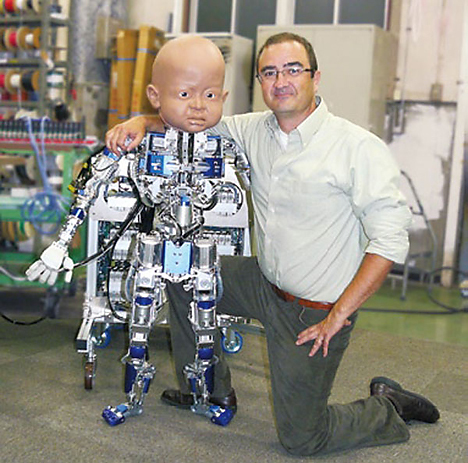 Researchers from the Machine Perception Laboratory at the University of California, San Diego have teamed up with Japanese robotics firm Kokoro Co., Ltd. to create a sophisticated humanoid robot modeled after a 1-year-old child. 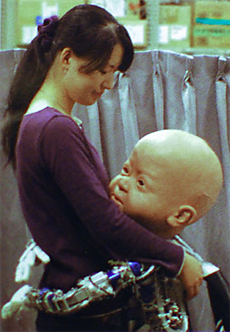 The baby robot -- named "Diego-san" -- is designed to help researchers study how infants develop motor skills during the first year of life, according to a recent Kokoro newsletter (PDF). 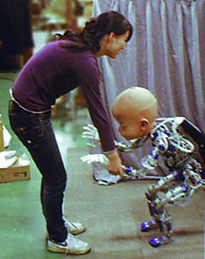 In addition to providing clues about how infants interact with the physical world, researchers will also use the robot to explore how babies acquire and refine the ability to use nonverbal communication such as gestures and facial expressions. 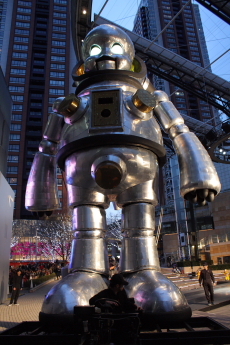 Diego-san's body has over 60 moving parts, making it Kokoro's most sophisticated robot to date. 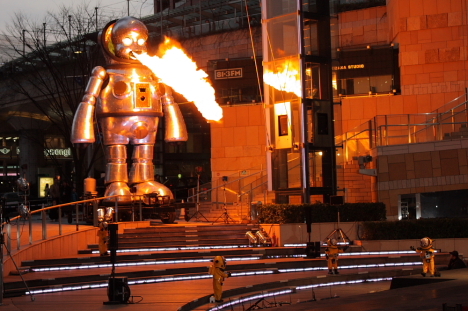 The robot weighs 30 kilograms (66 lbs) and is 1.3 meters (4 ft 3 in) tall, which is quite a bit larger than the average 1-year-old. 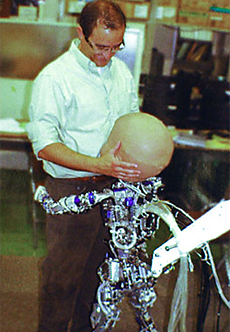 The baby humanoid also has a rather sizable head, thanks to 20 moving parts that allow it to make facial expressions, along with high-resolution cameras for eyes, an audio speaker in the mouth, and 6-axis accelerometers in the ears that allow it to detect orientation and movement. 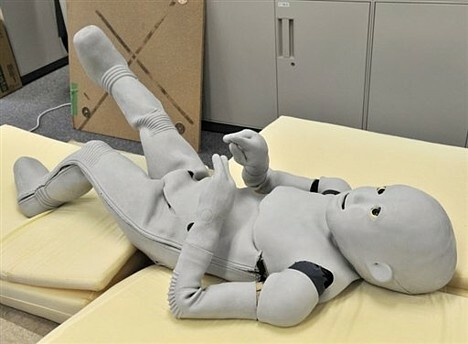 Other features include 5-fingered hands capable of holding objects such as plastic bottles, sensors that detect the amount of pressure placed on different joints in its body, and the ability to stand up from a sitting position in a chair. Apparently, Diego-san's face is still under development (the rubber face shown in the photos is just the first prototype). 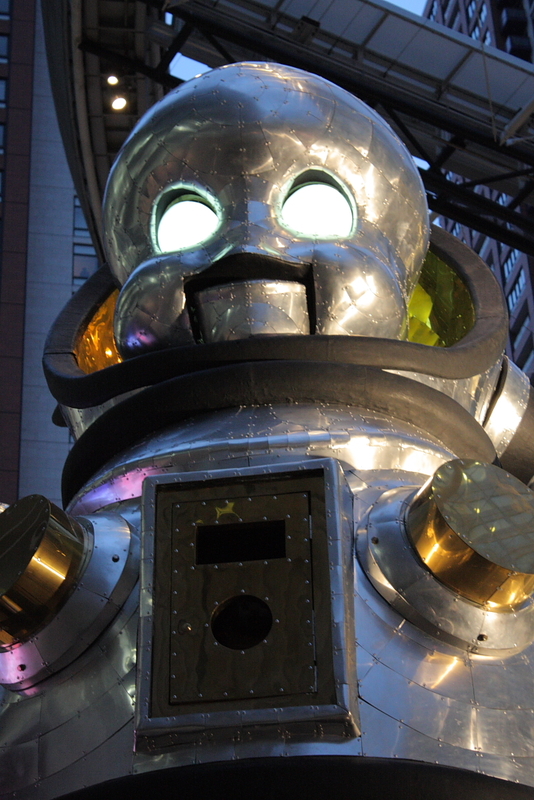 The researchers are still debating about whether the robot should have a realistic human-like face or one that looks more mechanical. 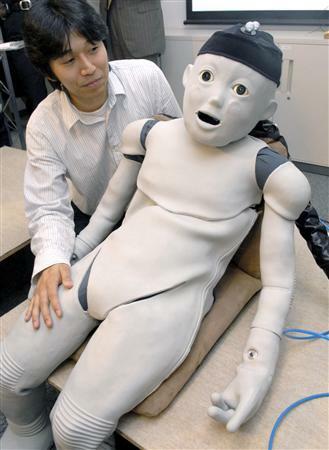 In the nearly two years since it was first unveiled to the world, the Child-robot with Biomimetic Body, or CB2, has been developing social skills by interacting with humans and watching their facial expressions, according to its creators at Osaka University. 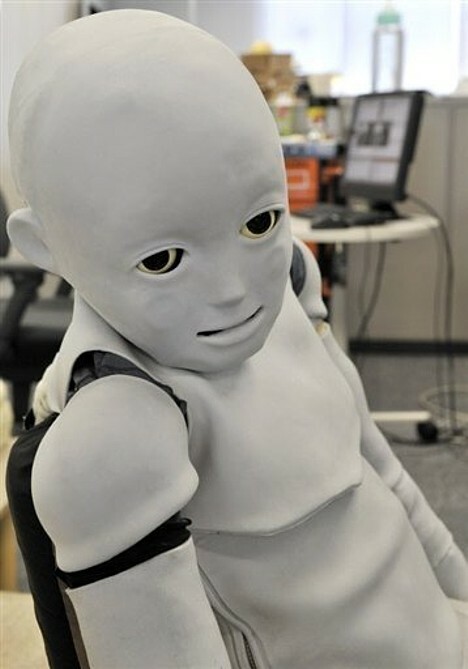 Comprised of robotics engineers, brain specialists, psychologists and other experts, the research team has been teaching the android to think like a baby by having it evaluate facial expressions and classify them into basic categories, such as happiness and sadness. The 130-centimter (4 ft 4 in) tall, 33-kilogram (73 lb) robot is equipped with eye cameras that record emotional expressions. 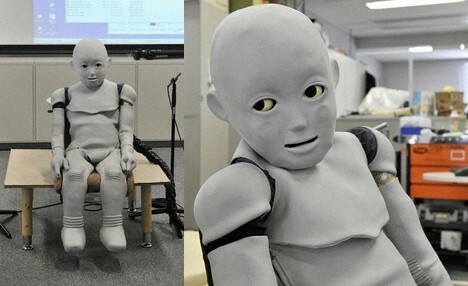 Designed to learn like an infant, the robot can memorize facial expressions and match them with physical sensations, which it detects via 197 pressure sensors under a suit of soft, silicone skin. In addition to watching faces, CB2 has been learning to walk. 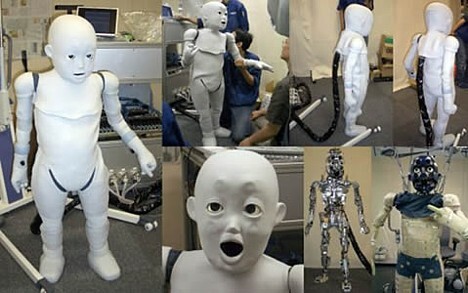 With 51 pneumatic "muscles," the little android can now amble through a room more smoothly than it could nearly two years ago, though it still requires the aid of a human. Within two years, the researchers hope the robot will gain the intelligence of a two-year-old child and the ability to speak in basic sentences. 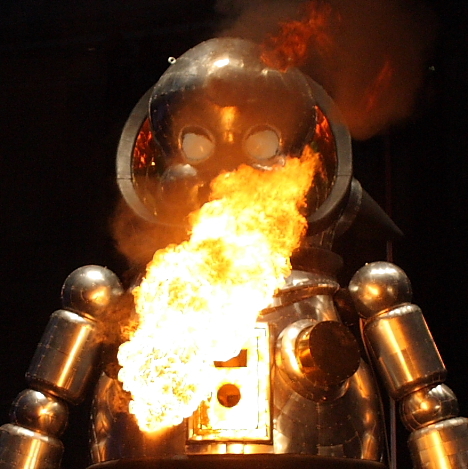 In the coming decades, the researchers expect to develop a "robo species" that has learning abilities somewhere between those of humans and chimps. New Age Diamonds, a Russian company specializing in the production of gem-quality synthetic diamonds, has entered the Japanese market with a new product called the "Heart-In Baby Diamond" -- a synthetic diamond made from the hair of newborn babies. The Heart-In Baby Diamond is the latest addition to the company's "Your Personal Diamond" (YPD) line of commemorative diamonds, which are custom-made from the hair or fur of your favorite person or pet, living or departed. Heart-In Baby Diamond prices range from 403,000 yen (US$3,500) for a 0.2-carat canary yellow diamond to 1,934,000 yen (US$17,000) for a 0.8-carat chameleon red diamond. As Japan's population begins to shrink, newborn babies become all the more precious and each birth is a greater cause for celebration. In addition, fewer mouths to feed results in increased amounts of disposable household wealth. New Age Diamonds appears to be capitalizing on these two factors by offering proud new parents an innovative and luxurious way to bestow gratitude on their blessed offspring. 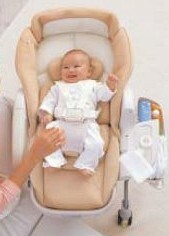 Combi�s maglev �Roanju Auto Swing� baby rocker will hit stores on February 3, the company announced today. 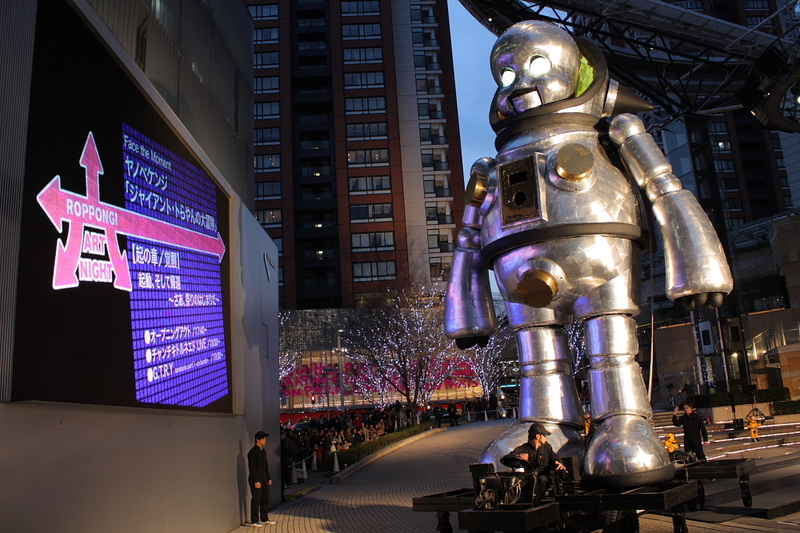 The rocker, which uses electromagnets to gently swing its passenger, will be available in two models -- the standard model RU-650 (68,250 yen) and the luxury model RU-700 (73,500 yen). 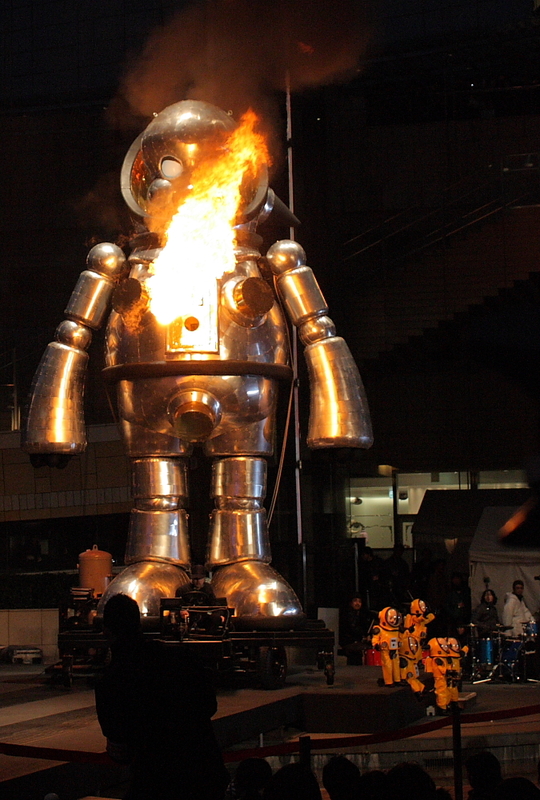 The company is aiming for sales of 40,000 units in the first year. 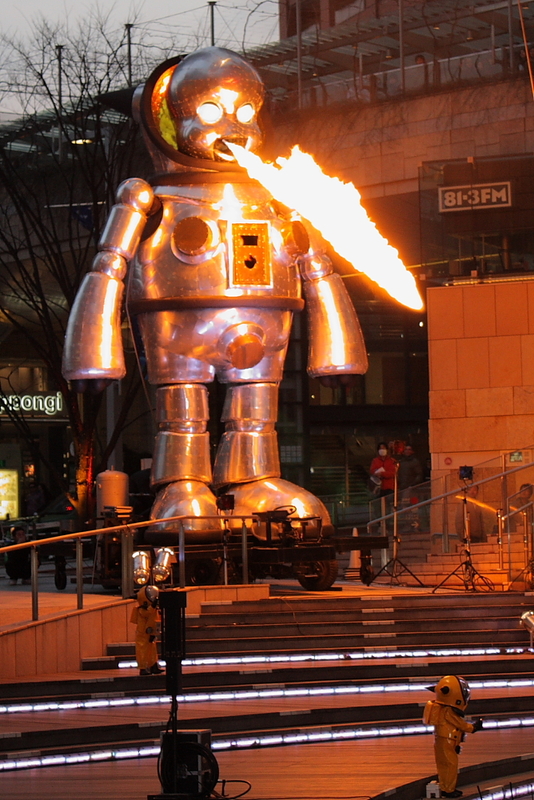 A light push of the hand activates the electromagnet-powered swinging, which continues for about 15 minutes. The rocker is silent compared to motor-driven models -- better for the little passenger to enjoy the audio system pre-loaded with 7 songs, including lullabies by Mozart and Brahms, and Grandfather's Clock. The sides of the rocker fold down to simplify the process of changing diapers, and the luxury model features an ergonomic inner sheet that supports the child�s head and back in a comfortable position. Designed for ages 0 to 4, the rocker is available in soft white or clear yellow (standard model), or in ivory (luxury model).